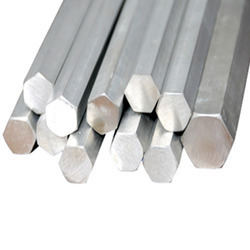 Prominent & Leading Manufacturer from New Delhi, we offer stainless steel 321 hex bar. We are considered as one of the pioneers engaged in offering a huge gamut of stainless steel bars.These are made of high-quality stainless steel material. Our Stainless steel round bars find numerous applications in the construction industry as well as other commercial applications where strength reinforcement is necessary and forms a vital part of the construction. Metal bars are used to create various items such as nuts, shafts.